That was Timothy Cardinal Dolan’s reaction when asked about NFL hopeful Michael Sam’s recent decision to come out publicly as a homosexual. 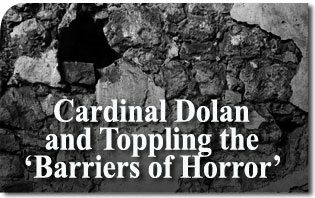 Cardinal Dolan’s words were the success of a very well studied and carefully prepared maneuver intended to generate impact on public opinion. This was yet another move by the homosexual movement in the ongoing Culture War against the family and traditional morality. Indeed, the liberal Daily Beast published a revealing article titled “How Howard Bragman Orchestrated Michael Sam’s Coming Out,” which narrates how a public relations specialist carefully prepared this maneuver to have a great impact in the media. “As the pace of the gay rights movement has accelerated in recent years, the sports industry has changed relatively little for men, with no publicly gay athletes in the N.F.L., the N.B.A., the N.H.L. or Major League Baseball. Against this backdrop, Mr. Sam could become a symbol for the country’s gay rights movement or a flash point in a football culture war — or both”. Was the illustrious Prelate aware just how crucial the support of a leading religious figure would be for the full success of this far-reaching psyop with public opinion? Is “Do not judge” the supreme commandment? The Cardinal thus hoisted “Do not judge” as an absolute biblical principle, a kind of supreme commandment that trumps chastity or marital fidelity. But human thought can only attain its end when, in making a judgment on the truth or goodness of something, it distinguishes truth from error, good from evil and just from unjust. Therefore, it would be absurd for God to forbid man from acting according to his rational nature. “Why do you notice the splinter in your brother’s eye, but do not perceive the wooden beam in your own eye? How can you say to your brother, ‘Let me remove that splinter from your eye,’ while the wooden beam is in your eye? You hypocrite, remove the wooden beam from your eye first; then you will see clearly to remove the splinter from your brother’s eye” (Matt. 7:3-5). In a 1973 article, the illustrious Brazilian thinker showed that the great obstacle for communism’s spread was a healthy “barrier of horror” that kept public opinion more or less immune to the egalitarian and atheistic ideology of the Red sect. However, thanks to optimistic politicians and intellectuals of the West who increasingly cozied up to communist dictators in a relaxed and friendly dialogue, little by little that wholesome horror in public opinion vanished. By analogy, the same can be said today about the erosion of the ‘barrier of horror’ regarding sinful homosexual acts. They used to indispose public opinion against the propaganda of the homosexual movement, but the horror is greatly diminished today. How did this happen? How was the horror undermined? Over the last few years, oblivious to Divine Justice and throwing caution to the wind, some groups and individuals inside the Church assumed a position of “openness,” “sympathy,” and a misguided “compassion,” not just towards homosexual acts but also for the movement’s propaganda. However, none of those Church figures had gone to the extreme of publicly and emphatically congratulating someone for his homosexual activism. Among these essential points—we can call them “non-negotiable values”—for which countless accepted martyrdom are the defense of virginity, chastity and of the family with marriage as its cornerstone—marriage, the union of one man and one woman indissolubly bound in wedlock. When an essential point of the natural or Divine Law is abandoned, the whole moral edifice crumbles, for society loses confidence in human reason as the proximate rule of action, and men reject God’s authority, the basis for the moral order. With this, the inevitable result can only be the utter collapse of the moral order. May the Blessed Virgin Mary, Help of Christians, assist all Americans and Catholics in these particularly difficult times. See also Alex Cohen, PR’s ‘Gay Guru’ Helps Celebrities Come Out, http://www.npr.org/2011/04/28/135771766/prs-gay-guru-helps-celebrities-come-out, accessed 3/17/14. Plinio Corrêa de Oliveira, “Enquanto Brejnev e Nixon se abraçam” [“While Brezhnev and Nixon Embrace,” June 24, 1973, Folha de S. Paulo, http://www.pliniocorreadeoliveira.info/FSP%2073-06-24%20Enquanto.htm#.UycYdM6eios, accessed Mar. 17, 2014. See, for example: “A Cardinal Gives Holy Communion to Mr. Lust,” June 5, 2013, https://www.tfp.org/tfp-home/catholic-perspective/a-cardinal-gives-holy-communion-to-mr-lust.html; “Bishop, Cardinals Deny Natural and Divine Law on Homosexual Practice,” Apr. 17, 2012, https://www.tfp.org/tfp-home/catholic-perspective/bishop-cardinals-deny-natural-and-divine-law-on-homosexual-practice.html; “The Cardinal of Montreal Favors Abortion, Condom Use, and Doctrinal Confusion on Morals,” Apr. 20, 2009, https://www.tfp.org/tfp-home/catholic-perspective/the-cardinal-of-montreal-favors-abortion-condom-use-and-doctrinal-confusion-on-morals.html; “Should the Church Change Her Position on Homosexuality and Divorce?” May 13, 2010, https://www.tfp.org/tfp-home/catholic-perspective/should-the-church-change-her-position-on-homosexuality-and-divorce.html. Abbot Guéranger, O.S.B., The Liturgical Year (St. Bonaventure Publications: Great Falls, July 2000) Fourth edition, volume 4, pp. 379-380, St. Cyril of Alexandria.